One of the oldest names in computing is joining the race to sequence the genome for $1,000 (Rs47,200). On Tuesday, International Business Machines Corp. (IBM) plans to give technical details of its effort to reach and surpass that goal, ultimately bringing the cost to as low as $100, making a personal genome cheaper than a ticket to a Broadway play. IBM already has a wide range of scientific and commercial efforts in fields such as making supercomputers designed specifically for modelling biological processes. The company’s researchers and executives hope to use its expertise in semiconductor manufacturing, computing and material science to design an integrated sequencing machine that will offer advances both in accuracy and speed, and will lower the cost. “More and more of biology is becoming an information science, which is very much a business for IBM," said Ajay Royyuru, senior manager for IBM’s computational biology center at its Thomas J. Watson Laboratory in Yorktown Heights, New York. DNA sequencing began at academic research centres in the 1970s, and the original Human Genome Project successfully sequenced the first genome in 2001 and cost roughly $1 billion. Since then, the field has accelerated. In the last four-five years, the cost of sequencing has been falling at a rate of tenfold annually, according to George M. Church, a Harvard geneticist. In a recent presentation in Los Angeles, Church said he expected the industry to stay on that curve, or some fraction of that improvement rate, for the foreseeable future. At least 17 start-up and existing companies are in the sequencing race, pursuing a range of third-generation technologies. Sequencing the human genome now costs $5,000-50,000, although Church emphasized that none of the efforts so far had been completely successful and no research group had yet sequenced the entire genome of a single individual. The IBM approach is based on what the firm describes as a “DNA transistor," which it hopes will be capable of reading individual nucleotides in a single strand of DNA as it is pulled through an atomic-size hole known as a nanopore. A complete system would consist of two fluid reservoirs separated by a silicon membrane containing an array of up to a million nanopores, making it possible to sequence vast quantities of DNA at once. The firm said the goal of the research was to build a machine that would have the capacity to sequence an individual genome of up to three billion bases, or nucleotides, “in several hours." A system with this power and speed is essential if progress is to be made toward personalized medicine, IBM researchers said. 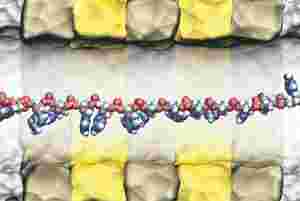 Despite the optimism of the IBM researchers, an independent scientist noted that various approaches to nanopore-based sequencing had been tried for years, with only limited success. “DNA strands seem to have a mind of their own," said Elaine R. Mardis, co-director of the genome center at Washington University in St Louis, noting that DNA often takes a number of formations other than a straight rod as it passes through a nanopore. Mardis also said previous efforts to create uniform silicon-based nanopore sensors had been disappointing.